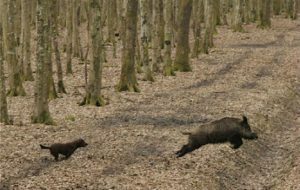 First and foremost it is important to consider the safety aspects of driven boar hunting. Like most activities there is an element of risk, but this can be managed to ensure safe, enjoyable hunting. To those that have not yet experienced the wonders and excitement of a driven boar hunt, it may appear quite alien to use beaters and dogs to drive large, powerful and potentially dangerous wild animals towards a number of hunters armed with high velocity rifles, but this is exactly what happens on many hunts throughout Europe mainly without incident. Shooting a wild boar or other animal during a driven hunt is not just a question of hitting a moving target and putting the bullet in the right place. There are a great number of factors to take into consideration at any one time, but the overriding issue at all times must be safety. Each hunter is responsible for safety, for themselves and of others, and should not squeeze the trigger unless prepared to accept the consequences. During a driven hunt of large game in Europe, there is a fairly standard protocol for managing safety and ensuring everyone experiences an enjoyable hunt. On the first night when the hunting party arrives at the hunting accommodation, it is customary for the chief of the hunting ground or agent to meet the group and brief them on the format of the hunting over the next few days. An overview is given to cover timings, number of drives per day, what can and can’t be shot, how pegs will be drawn, etc. and to answer any of the hunters’ questions. The clearly visible hunter, wearing orange, refrains from shooting as the cameraman, also wearing orange, puts himself at risk by stepping out into the middle of the ride to take the photo! On the first hunting morning a more detailed briefing will be given to the hunters by the chief of the hunting ground and, if necessary, with an interpreter present to translate as required. This is the time to ask any unanswered questions or to clarify anything as, once out in the woods on your peg you will be a long way from anyone and not allowed to move until the end of the drive. The location of your neighbours. Directions in which it is forbidden to shoot. Start and end of the drive and how, if at all, these will be indicated. The direction the beaters will take during the drive and approximately when they will arrive at your post. Once on your peg, get settled quickly and quietly. Take in your surroundings, work out where you can and can’t shoot safely. Where you think the animals might approach from and your most likely kill zones. 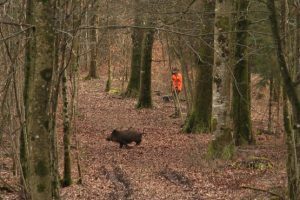 Being next to a tree is usually good practice as it will provide cover, a potential rest for longer range shooting and, in the most unlikely event that a boar charges you, a barrier. Hunters being charged by a wild boar during a driven hunt is very rare. Like most animals when facing danger, in this case from the beaters and their dogs, they tend to flee. However, if a wild boar is wounded, cornered or protecting its young, it may well charge. Generally it is the beaters and the dogs that are more at risk as they are literally at the sharp end. The old adage with boar is to keep shooting until they are dead and then keep an eye on them, just to make sure, because you never know…..
Each country in Europe has their own traditions and unique way of doing things, though many principles are similar. More often than not, hunters are placed at ground level, sometimes in raised platforms about 4 feet above ground level and less often in high seats or towers. Everyone taking part in a driven hunt should wear as much high visibility clothing as possible, for obvious reasons, and this applies equally when being placed in a tower. Some countries such as Poland and France will place hunters quite close together, typically 50m to 100m apart, and usually in a line. It is very important that everyone stays on the line and doesn’t move away from it, either putting themselves at risk or preventing a neighbour from taking a safe shot. In Hungary, for example, hunters tend to be placed much further apart as the drives are typically much larger, so it is very important that you can see your neighbour at a glance, hence the high visibility clothing. Arm and head bands are accepted, but barely good enough in most experienced hunters’ eyes. Make sure to wear arm bands on both arms at all times and not to take off your hat!! Given that you cannot always see your neighbours and no two drives are ever the same, the driven boar hunter needs to be constantly alert to a dynamic environment. The accepted safe angle between a potential target and a neighbour in France is a minimum of 30 degrees, but bullets can and do deflect on bones, trees, stones, etc, so ideally work on more angle rather than less. There is a lot to take in when a boar or, if you are lucky, a sounder of boar approaches you, but the process of determining when and where to take a safe shot becomes easier with experience.